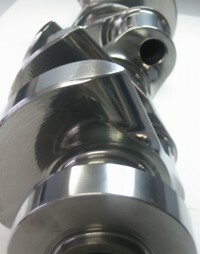 There are two primary reasons for coating a crankshaft. Coatings provide increased lubrication to the journals and aid in shedding oil from the counterweights. Depending on the intended use, a different coating may be required for the counterweights. The crank journals should be coated with a Dry Film Lubricant. In all cases, reduce any excessive build up with Scotch Bright or similar material; DO NOT assemble the crank and bearings “tight”. Properly done, there should be no need to change the clearances to allow for the coating. The coating will burnish to a near “0″ dimension during running. By coating with a dry film lubricant, you increase the lubrication levels, reducing friction and adding a protective layer. Normally lubrication is provided by a film of oil. 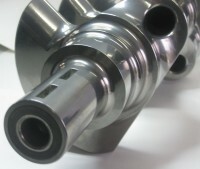 The rotational action of a crank coupled with the pressure-fed oiling system, aids in keeping a film of oil in place at higher pressures. However, when pressures exceed what the oil can carry, the oil will flow away from the point of contact. All C.I.C Dry Film Coatings can lubricate at pressures exceeding 350,000 PSI which is well beyond the pressure you would expect to see in use. In addition, the coatings are “fluid retaining” and help keep a layer of oil in place. The coating actually becomes more lubricious or slippery as pressure increases, which enhances the protective, friction-reducing action. The type of lubricating solids used will have a major effect on the ability of the coating to provide the desired protection. Certain ingredients such as “Teflon” are very slick only at low pressures and rotational speeds. Traditional lubricants like Graphite do not lubricate in environments where moisture is not present. C.I.C utilizes pressure lubricants that can carry tremendous loads while experiencing extremely fast rotational or sliding speeds. The resin must also be capable of maintaining a bond under the same conditions. The counter weights can be coated. Both these coatings have good oil shedding characteristics as it not only sheds oil but helps cool the crank by transferring the heat generated in the crank to the oil more rapidly.